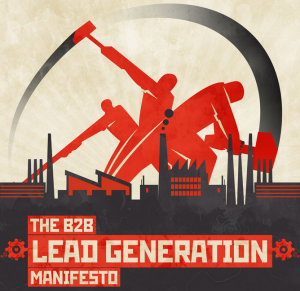 As part of our mission to provide useful information in an interesting way, below is an awesome infographic in the style of a vintage Russian propaganda poster that provides 5 principles of B2B lead generation for any company marketing to business buyers. The bonus tips after the infographic offer great advice to help you boost your B2B marketing lead generation performance. For webinars: People get busy, forget, or have to attend meetings, so they inevitably miss webinars. In the case of Dan Zarrella’s world record breaking webinar (31,100 registrants) – 65% of registrants didn’t show up. But don’t let this be the end of the story, you now have a list of business leads, so follow up with a recording and invite them to your next event. Make your CTA buttons big enough for fat fingers. Don’t send ANYONE to a homepage: All that nudging and stretching on a smartphone is annoying and makes people hit the back button. Keep your forms short: Tolerance for typing on mobile devices is low. Click to call: If your prospects need a little handholding, have a clickable phone number as well as the form. Lead nurturing is so important. Just because a potential client isn’t ready to buy this very moment that doesn’t mean you can’t move them through their buying cycle. Keep track of great leads for now and for 6 months from now when they’ve had a little more time. Noticing your article a day before a big meeting on Lead Gen. We are looking to improve our landing pages and increase our testing. Thanks for the tips. Thank you for such an information packed post. I must say that I’m glad I stopped my – it’s provided me with an immense value for my time spent reading. The mobile industry is growing at a phenomenal pace and I never knew that 64% of decision makers read their emails through mobile devices. I don’t see anything here about thou shalt give the reader a reason to act NOW instead of later…..